On October 19, 2013, No. 3 Clemson faced No. 5 Florida State met in a prime-time matchup with College GameDay in town and National Championship implications on the line in a battle of top-five teams in Death Valley. Three years later, on October 1, 2016, another set of top-five teams met in Tiger Town as No. 3 Louisville faced off against No. 5 Clemson. My goodness, things have changed in a hurry as the Tigers cruised past Florida State and Louisville on back-to-back weekends by a combined total of 136-26. In 2013, everything pointed towards an instant classic in Death Valley, until the opening offensive snap for Clemson. Stanton Seckinger fumbled a completed pass from Tajh Boyd, kicking off a nightmare Clemson fans would long remember. Winston took advantage of the mistake, completing a touchdown to Kelvin Benjamin to take an early lead. Clemson never recovered. Clemson finished the year 11-2 defeating Ohio State in the Orange Bowl. Florida State, on the other hand, went on to win the ACC and the 2013 National Championship over Auburn. Clemson's season was really good, FSU's was great. While the success in the bowl win was nice for the Tigers, fans still wondered if Clemson would ever get to Florida State's level. In order to do that, Dabo Swinney's Tigers had to beat the Seminoles-- not just once, but consistently. As for the Louisville game in 2016, it came down to the last offensive play for the Cardinals as Deshaun Watson and Lamar Jackson dueled for ACC supremacy. The Tigers picked up a 42-36 win and like the Seminoles in 2013, went on to win a national championship. Dabo Swinney's staff achieved the ultimate goal, winning a national title, but they didn't take their foot off the gas. Clemson continued to recruit talented players, but perhaps more importantly, they brought in great individuals. Players who are selfless and committed to the program, believing in Swinney's mindset that "Best is the Standard." That shift alone seems to be the most significant in the series with the Seminoles and the Cardinals, placing a considerable chasm between the three teams that once battled at the top of the ACC's Atlantic Division. However, Swinney isn't buying into the theory that the gap is growing between the Tigers and the rest of the ACC. 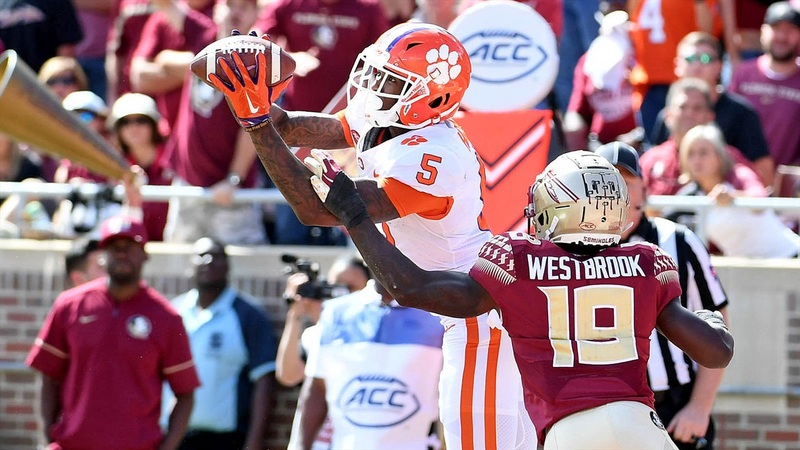 Fast forward to 2018, the Tigers have won three straight ACC Championships and are looking to become the first Atlantic Coast Conference school to win four consecutive division titles this week at Boston College. If Clemson can do that, they have a chance to win their fourth consecutive outright conference title, another ACC first. Add to that, three consecutive trips to the College Football Playoff, and a National Championship in 2016 and you can see why people feel that the Tigers are pulling away from the league. FSU struggled last season, limping to a 7-6 season, having to reschedule the game against Louisiana-Monroe to make a bowl game. Jimbo Fisher decided to step away for a $75 million dollar deal to be the head coach at Texas A&M. The Seminoles reached across the country and snagged Willie Taggart from Oregon hoping that he could bring life back into a Florida State team that had stumbled somewhere along the way, but things haven't gone as planned and last weekend's 59-10 loss to Clemson proved that there is a lot of work to do in Tallahassee. As for this past weekend, Clemson entered as nearly a forty point favorite against Louisville and proved they were worthy of Vegas' confidence in a hurry. The Cardinals could potentially move on from Bobby Petrino this season, setting Louisville back even further. In just five years, the two teams that once challenged the Tigers at the top of the division seem to be headed in the wrong direction. Florida State and Louisville should be taking notes from Clemson if they want to be competitive any time soon. For the Tigers, leadership is the key, and it all begins with Dabo Swinney. Having great players like Trevor Lawrence, Travis Etienne, and Christian Wilkins helps, but the character of each individual is the most important thing. The Tigers have always out recruited Louisville and are beginning to surpass the Seminoles. With the type of individuals Clemson is landing, it becomes clear that the Tigers aren't slowing down anytime soon. Right now, Clemson's rise to the top of the Atlantic Coast Conference seems solidified. Much like 2013, there was only one elite team on the field and that was the case in Tallahassee and again this past weekend in Death Valley. During Clemson's 59-10 victory over FSU and their 77-16 win over Lousiville, all the evidence showed how big the gap has become. Coach Swinney might not buy into it, but we do, and the Seminoles and Cardinals have a lot of ground to make up if they expect to challenge Clemson at the top of the Atlantic Division. Clemson has been so dominate lately it's crazy. I hope we see more of that at BC this weekend.